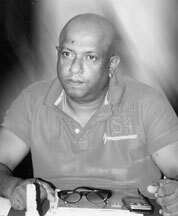 Text and pix: Nimal WIJESINGHE, Anuradhapura Additional District group corr. 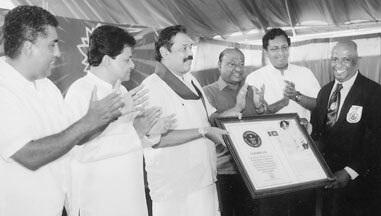 Wasantha receiving the Guinness (world record) certificate from President Mahinda Rajapaksa. North Central Province Governor Karunaratne Divulgane, Ministers Jonston Fernando, Anura Priyadarshana Yapa and North Central Chief Minister Berty Premalal Dissanayake are also in the picture. Wasantha Alexender Wickrama de Soyza, the iron man of Anuradhapura is now a world-class hero who has established 10 world Guinness records recently. This talented person with a fully shaven head is now preparing to break the records established by Dan, Netherlands (an American national). Netherlands has set 20 world records in various fields. Wasantha is now 50 years and a father of two grown up children. His son Shalitha (23) and daughter Dhilsa (20) are also Karate Black and Green Belt holders. 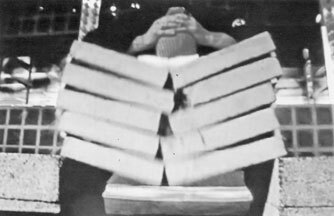 Zoysa created his maiden world record in 1998 at the Sugathadasa Stadium by breaking 525 tiles followed by breaking 12 concrete slabs with one head stroke of which the world record was held by Norwegian national Nave Larel who had smashed seven such slabs with his head. Breaking 104 tiles within 54 seconds (18th November, 2009) mashing 37 concrete slabs in fire with the head (12th February, 2010) and allowing to break 1/2 cube of metal (Land Master tractor load) placed on his stomach area, while lying on 522 iron nails fitted to a plank have been Zoysa's latest world records awaiting recognition. He told the Sunday Observer that he was determined to add another eleven world records bringing the total to 21, breaking the record being held by American national Dan Netherlands claiming the highest number of world records - 20. Iran man Alexander Wasantha Wickrama de Zoysa. Zoysa is hopeful that he could definitely achieve the goal in 2010. Zoysa said that he took to karate training in 1974 under D.A. Welgama, a renowned karate instructor. Shihan Nanda Siriwardana and Shihan Dr. Piyaratne Muthukumarana had been his other karate and Martial Arts instructors. "I am born and bred in historic Anuradhapura which had been a kingdom of great kings. The Stupas such as Ruwanweli Chetiya, Jetawanaramaya, the range of stone pillars and the reservoirs like Tisawewa and Basawakkulama greatly impressed me. Our ancestors had created such miracules solely depending on their physical and mental strength having combined such powers through spiritual advancement. This phenomenon guided me to show the world, the talents of the strength of the body and mind", Wasantha explained. He said that he started training and seasoning his body while attaining the spiritual development to take up the challenge of establishing Guinness records. He endeavoured to adjust his head carefully to make the head zone strong powerful and practised the art of dashing and attacking by head. He said that it took 10 years to season his head zone. Smashing concrete slabs with his head. Recently Zoysa was awarded the Guinness certificate for the world record he established by smashing 12 concrete slabs - each three inches thick, one foot in breadth, and four feet in length with one head stroke at the Anuradhapura President's House. Zoysa created this record on 23rd August, 2009. He was awarded the Guinness certificate on January 28, 2010. He said the President appreciated his world-class achievements and promised to facilitate him in every possible way. Zoysa appealed to the younger generation to take to karate to gain self reliance, self-restraint self-defence and the discipline so that they become eligible take leadership. He will launch classes for this purpose at CTB's Shalika Hall at Narahenpita free. All those interested could contact - Zoysa, 395 - 11C, Mudhitha Mawatha, Anuradhapura.